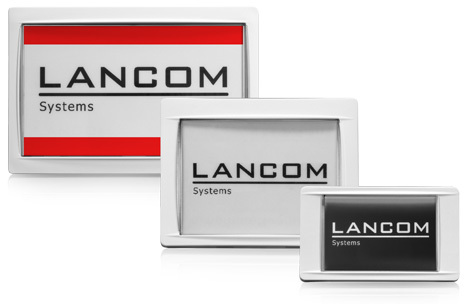 Wireless ePaper Displays from LANCOM offer state-of-the-art digital signage for a wide range of applications. The Displays are controlled by an innovative wireless technology with extremely low power consumption. They provide flicker-free viewing from any angle. The contents are always visible under artificial lighting. The Wireless ePaper Displays are managed and monitored by the high-performance LANCOM Wireless ePaper Server that comes with an interface (API) for connecting to calendar-management and enterprise ressource management systems. With the optional display of black, white, and red, messages can be displayed with highlights. 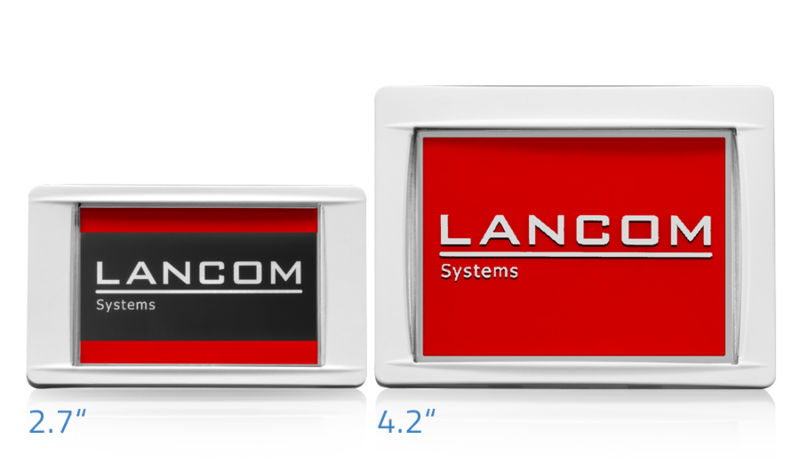 The LANCOM Wireless ePaper Displays are centrally controlled by a convenient program, the LANCOM Wireless ePaper Server. The appropriate interfaces allow data for room signs to be automatically transferred from calendar-management systems* such as Exchange, Domino, iCalender, and Office 365. For example, ongoing meetings and their participants can be displayed, as well as subsequent appointments and their times. Signage at the meeting-room doorways is always up to date, offers genuine informational value, and creates transparency. Available in three sizes: 7.4", 4.2", 2.7"
The LANCOM Wireless ePaper Displays (WDG-2) are available in a range of sizes for a wide variety of uses. The second-generation Wireless ePaper Displays offer three colors; black, white, and red. These new displays are ideal for presenting highlighted messages. Suitable for use in daylight, the Wireless ePaper Displays present text and graphics and offer perfect readability from any angle, without reflecting. The LANCOM Wireless ePaper Displays have a battery life of up to 5 years (with updates on average 2 times per day) thanks to the extremely low power consumption and active avoidance of interference. There is no need for costly cable installations. The Wireless ePaper Displays (WDG-2) are delivered with numerous accessories. Along with a wall-mounting bracket suitable for office environments and a stand for desktop usage, customers additionally receive a white and a black exchangeable frames to adapt the display to the color of its surroundings. The 7.4" LANCOM Wireless ePaper Displays (WDG-2) can be equipped with the LANCOM Wireless ePaper Premium Frame 7.4". This brushed stainless steel frame (optional extra) is an optical enhancement for its surroundings. 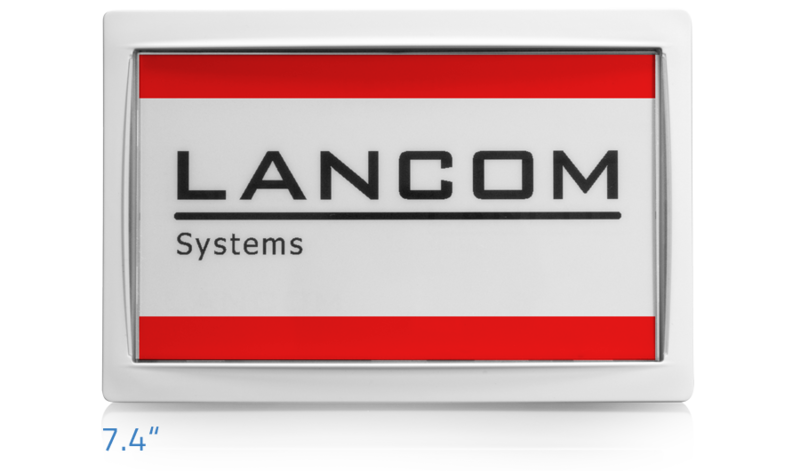 You have questions about our products or solutions, or are you looking for a LANCOM sales partner? Then let us know your wishes via contact form or feel free to contact us by phone.